and Georgia proper and South Ossetia (both grey). 5 UN member states recognize Abkhazia's independence. Abkhazia (/æbˈhɑːzɪə/ ( listen); Abkhazian: Аҧсны́, translit. Apsny [apʰsˈnɨ]; Georgian: აფხაზეთი, Apxazeti, [ɑpʰxɑzɛtʰi]; Russian: Абха́зия, tr. 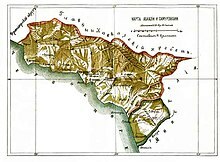 Abháziya, IPA: [ɐˈpxazʲɪjə]), officially the Republic of Abkhazia, is a de facto and partially recognized republic on the eastern coast of the Black Sea, south of the Greater Caucasus mountains, in northwestern Georgia. It covers 8,660 square kilometres (3,340 sq mi) and has a population of around 240,000. Its capital is Sukhumi and it is recognised as a state by Russia, Venezuela, Nicaragua, Nauru and Syria. While Georgia lacks control over Abkhazia, the Georgian government and most United Nations member states consider Abkhazia legally part of Georgia, whose constitution designates the area as the Autonomous Republic of Abkhazia. The status of Abkhazia is a central issue of the Georgian–Abkhazian conflict and Georgia–Russia relations. The region had autonomy within Soviet Georgia at the time when the Soviet Union began to disintegrate in the late 1980s. Simmering ethnic tensions between the Abkhaz—the region's "titular ethnicity"—and Georgians—the largest single ethnic group at that time—culminated in the 1992–1993 War in Abkhazia which resulted in Georgia's loss of control of most of Abkhazia, the de facto independence of Abkhazia, and the ethnic cleansing of Georgians from Abkhazia. Despite the 1994 ceasefire agreement and years of negotiations, the dispute remains unresolved. The long-term presence of a United Nations Observer Mission and a Russian-led Commonwealth of Independent States (CIS) peacekeeping force failed to prevent the flare-up of violence on several occasions. In August 2008, Abkhaz forces fought against Georgian forces during the Russo-Georgian War, which led to the formal recognition of Abkhazia by Russia, the annulment of the 1994 ceasefire agreement, and the termination of the UN mission. On 28 August 2008, the Parliament of Georgia declared Abkhazia a Russian-occupied territory, a stance supported by the vast majority of the international community. The Abkhazians call their homeland Аҧсны (Apsny, Aṗsny), popularly etymologised as "a land/country of the soul", yet literally meaning "a country of mortals (mortal beings)". It possibly first appeared in the seventh century in an Armenian text as Psin(oun), perhaps referring to the historical Apsilians. The state is formally designated as the "Republic of Abkhazia" or "Apsny". The Russian Абхазия (Abhazia) is adapted from the Georgian აფხაზეთი (Apkhazeti). In Mingrelian, Abkhazia is known as აბჟუა (Abzhua) or სააფხაზო (saapkhazo). Abkhazia's names in Western languages derived directly from the Russian form: Abkhazie in French; Abkhasien in Danish; Abchasien in German; Abcházie in Czech; Abchazië in Dutch; Abcasia in Italian; Abjasia in Spanish; and Abcázia in Portuguese. Between the 9th and 6th centuries BC, the territory of modern Abkhazia was part of the ancient Georgian kingdom of Colchis. This kingdom was subsequently absorbed in 63 BC into the Kingdom of Lazica. Between 1000 and 550 BC, the Greeks established trade colonies along the Black Sea coast of present-day Abkhazia, in particular at Pitiunt and Dioscurias, which was to become the capital of modern-day Abkhazia. Classical authors described various peoples living in the region and the great multitude of languages they spoke. Arrian, Pliny and Strabo have given accounts of the Abasgoi and Moschoi peoples somewhere in modern Abkhazia on the eastern shore of the Black Sea. The Roman Empire conquered Lazica in the 1st century AD and ruled it until the 4th century, following which it regained a measure of independence, but remained within the Byzantine Empire's sphere of influence. Although the exact time when the population of the region of Abkhazia was converted to Christianity has not been determined, it is known that the Stratophilus, Metropolitan of Pityus participated in the First Ecumenical Council in 325 in Nicaea. Around the mid 6th century AD, the Byzantines and the neighbouring Sassanid Persia fought for supremacy over Abkhazia for 20 years, a conflict known as the Lazic War. In 550, during the Lazic War, the Abasgians (Abasgoi) revolted against the Eastern Roman (Byzantine) Empire and called upon Sasanian assistance. General Bessas however suppressed the Abasgian revolt. The Kingdom of Abkhazia was united through dynastic succession with the newly formed Kingdom of Georgia in 1008 when Bagrat II of Abkhazia became Bagrat III of Georgia. Abkhazia, or Abasgia in classic sources, formerly part of Colchis and later of Lazica until the late 690s, was a princedom under Byzantine authority. Anacopia was the princedom's capital. The country was mostly Christian, with the archbishop's seat in Pityus. An Arab incursion into Abkhazia led by Marwan II, was repelled by Leon I jointly with his Lazic and Iberian allies in 736. Leon I then married Mirian’s daughter, and a successor, Leon II exploited this dynastic union to acquire Lazica in the 770s. Presumably considered as a successor state of Lazica (Egrisi, in Georgian sources), this new polity continued to be referred to as Egrisi in some contemporary Georgian (e.g., The Vitae of the Georgian Kings by Leonti Mroveli) and Armenian (e.g., The History of Armenia by Hovannes Draskhanakertsi) chronicles. The successful defense against the Arabs, and new territorial gains, gave the Abkhazian princes enough power to claim more autonomy from the Byzantine Empire. Towards circa 778, Leon II won his full independence with the help of the Khazars; he assumed the title of "King of the Abkhazians" and transferred his capital to the western Georgian city of Kutaisi. During this period the Georgian language replaced Greek as the language of literacy and culture. 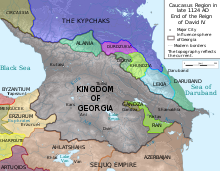 The western Georgian kingdom flourished between 850 and 950 when it annexed significant parts of central Georgia. A period of unrest ensued, which ended as Abkhazia and eastern Georgian states were unified under a single Georgian monarchy, ruled by King Bagrat III (who was buried in the Monastery of Bedia in eastern Abkhazia) at the end of the 10th century and the beginning of the 11th century. In 12th century, king David the Builder appointed the son of shah Shirvan Otago as an Eristavi of Abkhazia, who later became the founder of House of Shervashidze (also known as Sharvashidze, or Chachba). In the 1240s, Mongols divided Georgia into eight military-administrative sectors (dumans), the territory of contemporary Abkhazia formed part of the duman administered by Tsotne Dadiani. In the 16th century, after the break-up of the Georgian Kingdom into small kingdoms and principalities, Principality of Abkhazia (nominally a vassal of the Kingdom of Imereti) emerged, ruled by the Shervashidze dynasty. Since the 1570s, when the Ottoman navy occupied the fort of Tskhumi, Abkhazia came under the influence of the Ottoman Empire and Islam. Under Ottoman rule, the majority of Abkhaz elite converted to Islam. The principality retained a degree of autonomy. Georgia signed a treaty with Russia for protection against the Ottoman Empire in 1773 and was seemingly absorbed, while Abkhazia sought protection from Russia in 1801, but was declared as "an autonomous principality" by the Russians in 1810. Russia then annexed Abkhazia in 1864, and Abkhaz resistance was quashed as the Russians deported Muslim Abkhaz to Ottoman territories. The borders of the Sukhumi District of the Kutaisi Governorate in 1899 when Abkhazia was part of the Russian Empire. In the beginning of the 19th century, while the Russians and Ottomans were vying for control of the region, the rulers of Abkhazia shifted back and forth across the religious divide. The first attempt to enter into relations with Russia was made by Keilash Bey in 1803, shortly after the incorporation of eastern Georgia into the expanding Tsarist empire (1801). However, the pro-Ottoman orientation prevailed for a short time after his assassination by his son Aslan-Bey on 2 May 1808. On 2 July 1810, the Russian Marines stormed Sukhum-Kale and had Aslan-Bey replaced with his rival brother, Sefer-Bey (1810–1821), who had converted to Christianity and assumed the name of George. Abkhazia joined the Russian Empire as an autonomous principality, in 1810. However, George's rule, as well as that of his successors, was limited to the neighbourhood of Sukhum-Kale and the Bzyb area. The next Russo-Turkish war strongly enhanced the Russian positions, leading to a further split in the Abkhaz elite, mainly along religious divisions. During the Crimean War (1853–1856), Russian forces had to evacuate Abkhazia and Prince Michael (1822–1864) seemingly switched to the Ottomans. Later on, the Russian presence strengthened and the highlanders of Western Caucasia were finally subjugated by Russia in 1864. The autonomy of Abkhazia, which had functioned as a pro-Russian "buffer zone" in this troublesome region, was no longer needed by the Tsarist government and the rule of the Shervashidze came to an end; in November 1864, Prince Michael was forced to renounce his rights and resettle in Voronezh. Later that same year, Abkhazia was incorporated into the Russian Empire as a special military province of Sukhum-Kale which was transformed, in 1883, into an okrug as part of the Kutais Guberniya. Large numbers of Muslim Abkhazians, said to have constituted as much as 40% of the Abkhazian population, emigrated to the Ottoman Empire between 1864 and 1878 with other Muslim population of Caucasus, a process known as Muhajirism. Large areas of the region were left uninhabited and many Armenians, Georgians, Russians and others subsequently migrated to Abkhazia, resettling much of the vacated territory. Some Georgian historians assert that Georgian tribes (Svans and Mingrelians) had populated Abkhazia since the time of the Colchis kingdom. By official decision of the Russian authorities the residents of Abkhazia and Samurzakano had to study and pray in Russian. After the mass deportation of 1878, Abkhazians were left in the minority, officially branded "guilty people", and had no leader capable of mounting serious opposition to Russification. On 17 March 1898 the synodal department of the Russian Orthodox Church of Georgia-Imereti, by order 2771, again prohibited teaching and the conduct of religious services in church schools and churches of the Sukhumi district in Georgian. Mass protests by the Georgian population of Abkhazia and Samurzakano followed, news of which reached the Russian emperor. On 3 September 1898 the Holy Synod issued order 4880 which decreed that those parishes where the congregation was Mingrelians i.e. Georgians, conduct both church services and church education in Georgian, while Abkhazian parishes use old Slavic. In the Sukhumi district, this order was carried out in only three of 42 parishes. Tedo Sakhokia demanded the Russian authorities introduce Abkhazian and Georgian languages in church services and education. The official response was a criminal case brought against Tedo Sakhokia and leaders of his "Georgian Party" active in Abkhazia. Map of the Soviet Caucasus (1957–91) showing the Abkhaz ASSR within the Georgian SSR. The Russian Revolution of 1917 led to the creation of an independent Georgia which included Abkhazia, in 1918. German support enabled the Georgians to repel the Bolshevik threat from Abkhazia in 1918. The 1921 constitution granted Abkhazia autonomy. In 1921, the Bolshevik Red Army invaded Georgia and ended its short-lived independence. Abkhazia was made a Socialist Soviet Republic (SSR Abkhazia) with the ambiguous status of a treaty republic associated with the Georgian SSR. In 1931, Joseph Stalin made it an autonomous republic (Abkhaz Autonomous Soviet Socialist Republic or in short Abkhaz ASSR) within the Georgian SSR. Despite its nominal autonomy, it was subjected to strong direct rule from central Soviet authorities. Under the rule of Stalin and Beria Abkhaz schools were closed, requiring Abkhaz children to study in the Georgian language. The publishing of materials in Abkhazian dwindled and was eventually stopped altogether; Abkhazian schools were closed in 1945/46. In the terror of 1937–38, the ruling elite was purged of Abkhaz and by 1952 over 80% of the 228 top party and government officials and enterprise managers were ethnic Georgians; there remained 34 Abkhaz, 7 Russians and 3 Armenians in these positions. Georgian Communist Party leader Candide Charkviani supported the Georgianization of Abkhazia. The policy of repression was eased after Stalin's death and Beria's execution, and the Abkhaz were given a greater role in the governance of the republic. As in most of the smaller autonomous republics, the Soviet government encouraged the development of culture and particularly of literature. The Abkhazian ASSR was the only autonomous republic in the USSR in which the language of the titular nation (in that case Abkhazian) was confirmed in its constitution as one of its official languages. As the Soviet Union began to disintegrate at the end of the 1980s, ethnic tensions grew between the Abkhaz and Georgians over Georgia's moves towards independence. Many Abkhaz opposed this, fearing that an independent Georgia would lead to the elimination of their autonomy, and argued instead for the establishment of Abkhazia as a separate Soviet republic in its own right. With the onset of perestroika, the agenda of Abkhaz nationalists became more radical and exclusive. In 1988 they began to ask for the reinstatement of Abkhazia's former status of Union republic, as the submission of Abkhazia to another Union republic was not considered to give enough guarantees of their development. They justified their request by referring to the Leninist tradition of the right of nations to self-determination, which, they asserted, was violated when Abkhazia's sovereignty was curtailed in 1931. In June 1988, a manifesto defending Abkhaz distinctiveness (known as the Abkhaz Letter) was sent to Soviet leader Mikhail Gorbachev. The Georgian–Abkhaz dispute turned violent on 16 July 1989 in Sukhumi. Sixteen Georgians are said to have been killed and another 137 injured when they tried to enroll in a Georgian university instead of an Abkhaz one. After several days of violence, Soviet troops restored order in the city and blamed rival nationalist paramilitaries for provoking confrontations. In March 1990, Georgia declared sovereignty, unilaterally nullifying treaties concluded by the Soviet government since 1921 and thereby moving closer to independence. The Republic of Georgia boycotted the 17 March 1991 all-Union referendum on the renewal of the Soviet Union called by Gorbachev; however, 52.3% of Abkhazia's population (almost all of the ethnic non-Georgian population) took part in the referendum and voted by an overwhelming majority (98.6%) to preserve the Union. Most ethnic non-Georgians in Abkhazia later boycotted a 31 March referendum on Georgia's independence, which was supported by a huge majority of Georgia's population. Within weeks, Georgia declared independence on 9 April 1991, under former Soviet dissident Zviad Gamsakhurdia. Under Gamsakhurdia, the situation was relatively calm in Abkhazia and a power-sharing agreement was soon reached between the Abkhaz and Georgian factions, granting to the Abkhaz a certain over-representation in the local legislature. Gamsakhurdia's rule was soon challenged by armed opposition groups, under the command of Tengiz Kitovani, that forced him to flee the country in a military coup in January 1992. Former Soviet foreign minister and architect of the disintegration of the USSR Eduard Shevardnadze became the country's head of state, inheriting a government dominated by hard-line Georgian nationalists. He was not an ethnic nationalist but did little to avoid being seen as supporting his administration's dominant figures and the leaders of the coup that swept him to power. On 21 February 1992, Georgia's ruling Military Council announced that it was abolishing the Soviet-era constitution and restoring the 1921 Constitution of the Democratic Republic of Georgia. Many Abkhaz interpreted this as an abolition of their autonomous status, although the 1921 constitution contained a provision for the region's autonomy. On 23 July 1992, the Abkhaz faction in the republic's Supreme Council declared effective independence from Georgia, although the session was boycotted by ethnic Georgian deputies and the gesture went unrecognised by any other country. The Abkhaz leadership launched a campaign of ousting Georgian officials from their offices, a process which was accompanied by violence. In the meantime, the Abkhaz leader Vladislav Ardzinba intensified his ties with hard-line Russian politicians and military elite and declared he was ready for a war with Georgia. In August 1992, the Georgian government accused Gamsakhurdia's supporters of kidnapping Georgia's Interior Minister and holding him captive in Abkhazia. The Georgian government dispatched 3,000 soldiers to the region, ostensibly to restore order. The Abkhaz were relatively unarmed at the time and the Georgian troops were able to march into Sukhumi with relatively little resistance and subsequently engaged in ethnically based pillage, looting, assault, and murder. The Abkhaz units were forced to retreat to Gudauta and Tkvarcheli. The Abkhaz military defeat was met with a hostile response by the self-styled Confederation of Mountain Peoples of the Caucasus, an umbrella group uniting a number of movements in the North Caucasus, including elements of Circassians, Abazins, Chechens, Cossacks, Ossetians and hundreds of volunteer paramilitaries and mercenaries from Russia, including the then-little-known Shamil Basayev, later a leader of the anti-Moscow Chechen secessionists. They sided with the Abkhaz separatists to fight against the Georgian government. In the case of Basayev, it has been suggested that when he and the members of his battalion came to Abkhazia, they received training by the Russian Army (though others dispute this), presenting another possible motive. In September, the Abkhaz and Russian paramilitaries mounted a major offensive against Gagra after breaking a cease-fire, which drove the Georgian forces out of large swathes of the republic. Shevardnadze's government accused Russia of giving covert military support to the rebels with the aim of "detaching from Georgia its native territory and the Georgia-Russian frontier land". 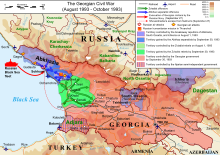 1992 ended with the rebels in control of much of Abkhazia northwest of Sukhumi. The conflict was in stalemate until July 1993, when Abkhaz separatist militias launched an abortive attack on Georgian-held Sukhumi. They surrounded and heavily shelled the capital, where Shevardnadze was trapped. The warring sides agreed to a Russian-brokered truce in Sochi at the end of July. But the ceasefire broke down again on 16 September 1993. Abkhaz forces, with armed support from outside Abkhazia, launched attacks on Sukhumi and Ochamchira. Notwithstanding UN Security Council's call for the immediate cessation of hostilities and its condemnation of the violation of the ceasefire by the Abkhaz side, fighting continued. After ten days of heavy fighting, Sukhumi was taken by Abkhazian forces on 27 September 1993. Shevardnadze narrowly escaped death, after vowing to stay in the city no matter what. He was forced to flee when separatist snipers fired on the hotel where he was staying. Abkhaz, North Caucasian militants, and their allies committed numerous atrocities against the city's remaining ethnic Georgians, in what has been dubbed the Sukhumi Massacre. The mass killings and destruction continued for two weeks, leaving thousands dead and missing. The Abkhaz forces quickly overran the rest of Abkhazia as the Georgian government faced a second threat: an uprising by the supporters of the deposed Zviad Gamsakhurdia in the region of Mingrelia (Samegrelo). Only a small region of eastern Abkhazia, the upper Kodori gorge, remained under Georgian control (until 2008). During the war, gross human rights violations were reported on both sides (see Human Rights Watch report). Georgian troops have been accused of having committed looting and murders "for the purpose of terrorising, robbing and driving the Abkhaz population out of their homes" in the first phase of the war (according to Human Rights Watch), while Georgia blames the Abkhaz forces and their allies for the ethnic cleansing of Georgians in Abkhazia, which has also been recognised by the Organization for Security and Cooperation in Europe (OSCE) Summits in Budapest (1994), Lisbon (1996) and Istanbul (1999). Exhibition at the 2005 commemoration of the ethnic cleansing in Abkhazia, held on its 12th anniversary in Tbilisi. Before the 1992 War, Georgians made up nearly half of Abkhazia's population, while less than one-fifth of the population was Abkhaz. As the war progressed, confronted with hundreds of thousands of ethnic Georgians who were unwilling to leave their homes, the Abkhaz separatists implemented the process of ethnic cleansing in order to expel and eliminate the Georgian ethnic population in Abkhazia. The exact number of those killed during the ethnic cleansing is disputed, however, it ranges from 8,000 to 10,000 people, not including the civilians who were killed in 1998 during the separatist onslaught on Gali region. Roughly up to 250,000 ethnic Georgians were expelled from their homes. Slightly over 200,000 Georgians remain displaced in Georgia proper. The campaign of ethnic cleansing also included Russians, Armenians, Greeks, moderate Abkhaz and other minor ethnic groups living in Abkhazia. More than 20,000 houses owned by ethnic Georgians were destroyed. Hundreds of schools, kindergartens, churches, hospitals, historical monuments were pillaged and destroyed. Following the process of ethnic cleansing and mass expulsion, the population of Abkhazia has been reduced to 216,000, from 525,000 in 1989. Of about 250,000 Georgian refugees, some 60,000 Georgian refugees subsequently returned to Abkhazia's Gali District between 1994 and 1998, but tens of thousands were displaced again when fighting resumed in the Gali District in 1998. Nevertheless, between 40,000 and 60,000 refugees have returned to the Gali District since 1998, including persons commuting daily across the ceasefire line and those migrating seasonally in accordance with agricultural cycles. The human rights situation remained precarious for a while in the Georgian-populated areas of the Gali District. The United Nations and other international organisations have been fruitlessly urging the Abkhaz de facto authorities "to refrain from adopting measures incompatible with the right to return and with international human rights standards, such as discriminatory legislation... [and] to cooperate in the establishment of a permanent international human rights office in Gali and to admit United Nations civilian police without further delay." Key officials of the Gali District are virtually all ethnic Abkhaz, though their support staff are ethnic Georgian. Abkhazians carrying the republic's flags in a parade. Presidential elections were held in Abkhazia on 3 October 2004. Russia supported Raul Khadjimba, the prime minister backed by the ailing outgoing separatist President Vladislav Ardzinba. Posters of Russia's President Vladimir Putin together with Khadjimba, who, like Putin, had worked as a KGB official, were everywhere in Sukhumi. Deputies of Russia's parliament and Russian singers, led by Joseph Cobsohn, a State Duma deputy and a popular singer, came to Abkhazia, campaigning for Khadjimba. However Raul Khadjimba lost the elections to Sergei Bagapsh. The tense situation in the republic led to the cancellation of the election results by the Supreme Court. After that, a deal was struck between former rivals to run jointly, with Bagapsh as a presidential candidate and Khadjimba as a vice presidential candidate. They received more than 90% of the votes in the new election. In July 2006, Georgian forces launched a successful police operation against the rebelled administrator of the Georgian-populated Kodori Gorge, Emzar Kvitsiani. Kvitsiani had been appointed by the previous president of Georgia Edvard Shevardnadze and refused to recognise the authority of president Mikheil Saakashvili, who succeeded Shevardnadze after the Rose Revolution. Although Kvitsiani escaped capture by Georgian police, the Kodori Gorge was brought back under the control of the central government in Tbilisi. Sporadic acts of violence continued throughout the postwar years. Despite the peacekeeping status of the Russian peacekeepers in Abkhazia, Georgian officials routinely claimed that Russian peacekeepers were inciting violence by supplying Abkhaz rebels with arms and financial support. Russian support of Abkhazia became pronounced when the Russian ruble became the de facto currency and Russia began issuing passports to the population of Abkhazia. Georgia has also accused Russia of violating its airspace by sending helicopters to attack Georgian-controlled towns in the Kodori Gorge. In April 2008, a Russian MiG – prohibited from Georgian airspace, including Abkhazia – shot down a Georgian UAV. On 9 August 2008, Abkhazian forces fired on Georgian forces in Kodori Gorge. This coincided with the 2008 South Ossetia war where Russia decided to support the Ossetian separatists who had been attacked by Georgia. The conflict escalated into a full-scale war between the Russian Federation and the Republic of Georgia. On 10 August 2008, an estimated 9,000 Russian soldiers entered Abkhazia ostensibly to reinforce the Russian peacekeepers in the republic. About 1,000 Abkhazian soldiers moved to expel the residual Georgian forces within Abkhazia in the Upper Kodori Gorge. By 12 August the Georgian forces and civilians had evacuated the last part of Abkhazia under Georgian government control. Russia recognised the independence of Abkhazia on 26 August 2008. This was followed by the annulment of the 1994 ceasefire agreement and the termination of UN and OSCE monitoring missions. On 28 August 2008, the Parliament of Georgia passed a resolution declaring Abkhazia a Russian-occupied territory. Since independence was recognised by Russia, a series of controversial agreements were made between the Abkhazian government and the Russian Federation that leased or sold a number of key state assets and relinquished control over the borders. In May 2009 several opposition parties and war veteran groups protested against these deals complaining that they undermined state sovereignty and risked exchanging one colonial power (Georgia) for another (Russia). The Vice President, Raul Khadjimba, resigned on 28 May saying he agreed with the criticism the opposition had made. Subsequently, a conference of opposition parties nominated Raul Khadjimba as their candidate in the December 2009 Abkhazian presidential election won by Sergei Bagapsh. In the spring of 2014, the opposition submitted an ultimatum to President Aleksandr Ankvab to dismiss the government and make radical reforms. On 27 May 2014, in the centre of Sukhumi, 10,000 supporters of the Abkhaz opposition gathered for a mass demonstration. On the same day, Ankvab's headquarters in Sukhumi was stormed by opposition groups led by Raul Khadjimba, forcing him into flight to Gudauta. The opposition claimed that the protests were sparked by poverty, but the main point of contention was President Ankvab's liberal policy towards ethnic Georgians in the Gali region. The opposition said these policies could endanger Abkhazia's ethnic Abkhazian identity. After Ankvab fled the capital, on 31 May, the People's Assembly of Abkhazia appointed parliamentary speaker Valery Bganba as acting president, declaring Ankvab unable to serve. It also decided to hold an early presidential election on 24 August 2014. Ankvab soon declared his formal resignation, although he accused his opponents of acting immorally and violating the constitution. Khajimba was later elected president, taking office in September 2014. In November 2014, Vladimir Putin moved to formalise the Abkhazian military's relationship as part of the Russian armed forces, signing a treaty with Khajimba. The Georgian government denounced the agreement as "a step towards annexation". Map of Georgia highlighting Abkhazia (green) and South Ossetia (purple). 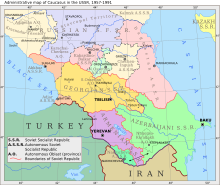 Abkhazia, Artsakh, Transnistria, and South Ossetia are post-Soviet "frozen conflict" zones. These four states maintain friendly relations with each other and form the Community for Democracy and Rights of Nations. Russia and Nicaragua officially recognised Abkhazia after the Russo-Georgian War. Venezuela recognised Abkhazia in September 2009. In December 2009, Nauru recognised Abkhazia, reportedly in return for $50 million in humanitarian aid from Russia. The unrecognised republic of Transnistria and the partially recognised republic of South Ossetia have recognised Abkhazia since 2006. Abkhazia is also a member of the Unrepresented Nations and Peoples Organization (UNPO). A majority of sovereign states recognise Abkhazia as an integral part of Georgia and support its territorial integrity according to the principles of international law, although Belarus has expressed sympathy toward the recognition of Abkhazia. Some have officially noted Abkhazia as under occupation by the Russian military. The United Nations has been urging both sides to settle the dispute through diplomatic dialogue and ratifying the final status of Abkhazia in the Georgian constitution. However, the Abkhaz de facto government considers Abkhazia a sovereign country even if it is recognised by few other countries. In early 2000, then-UN Special Representative of the Secretary General Dieter Boden and the Group of Friends of Georgia, consisting of the representatives of Russia, the United States, Britain, France, and Germany, drafted and informally presented a document to the parties outlining a possible distribution of competencies between the Abkhaz and Georgian authorities, based on core respect for Georgian territorial integrity. The Abkhaz side, however, has never accepted the paper as a basis for negotiations. Eventually, Russia also withdrew its approval of the document. In 2005 and 2008, the Georgian government offered Abkhazia a high degree of autonomy and possible federal structure within the borders and jurisdiction of Georgia. On 18 October 2006, the People's Assembly of Abkhazia passed a resolution, calling upon Russia, international organisations and the rest of the international community to recognise Abkhaz independence on the basis that Abkhazia possesses all the properties of an independent state. The United Nations has reaffirmed "the commitment of all Member States to the sovereignty, independence and territorial integrity of Georgia within its internationally recognised borders" and outlined the basic principles of conflict resolution which call for immediate return of all displaced persons and for non-resumption of hostilities. Georgia accuses the Abkhaz secessionists of having conducted a deliberate campaign of ethnic cleansing of up to 250,000 Georgians, a claim supported by the Organization for Security and Co-operation in Europe (OSCE; Budapest, Lisbon and Istanbul declaration). The UN Security Council has avoided the use of the term "ethnic cleansing" but has affirmed "the unacceptability of the demographic changes resulting from the conflict". On 15 May 2008, the United Nations General Assembly adopted a non-binding resolution recognising the right of all refugees (including victims of reported "ethnic cleansing") to return to Abkhazia and to retain or regain their property rights there. It "regretted" the attempts to alter pre-war demographic composition and called for the "rapid development of a timetable to ensure the prompt voluntary return of all refugees and internally displaced persons to their homes." On 28 March 2008, the President of Georgia Mikheil Saakashvili unveiled his government's new proposals to Abkhazia: the broadest possible autonomy within the framework of a Georgian state, a joint free economic zone, representation in the central authorities including the post of vice-president with the right to veto Abkhaz-related decisions. The Abkhaz leader Sergei Bagapsh rejected these new initiatives as "propaganda", leading to Georgia's complaints that this scepticism was "triggered by Russia, rather than by real mood of the Abkhaz people." On 3 July 2008, the OSCE Parliamentary Assembly passed a resolution at its annual session in Astana, expressing concern over Russia's recent moves in breakaway Abkhazia. The resolution calls on the Russian authorities to refrain from maintaining ties with the breakaway regions "in any manner that would constitute a challenge to the sovereignty of Georgia" and also urges Russia "to abide by OSCE standards and generally accepted international norms with respect to the threat or use of force to resolve conflicts in relations with other participating States." On 9 July 2012, the OSCE Parliamentary Assembly passed a resolution at its annual session in Monaco, underlining Georgia's territorial integrity and referring to breakaway Abkhazia and South Ossetia as "occupied territories". The resolution "urges the Government and the Parliament of the Russian Federation, as well as the de facto authorities of Abkhazia, Georgia and South Ossetia, Georgia, to allow the European Union Monitoring Mission unimpeded access to the occupied territories." It also says that the OSCE Parliamentary Assembly is "concerned about the humanitarian situation of the displaced persons both in Georgia and in the occupied territories of Abkhazia, Georgia and South Ossetia, Georgia, as well as the denial of the right of return to their places of living." The Assembly is the parliamentary dimension of the OSCE with 320 lawmakers from the organisation's 57 participating states, including Russia. In late October 2008 President Saakashvili signed into law legislation on the occupied territories passed by the Georgian Parliament. The law covers the breakaway regions of Abkhazia and Tskhinvali (territories of former South Ossetian Autonomous Oblast). The law spells out restrictions on free movement and economic activity in the territories. In particular, according to the law, foreign citizens should enter the two breakaway regions only through Georgia proper. Entry into Abkhazia should be carried out from the Zugdidi District and into South Ossetia from the Gori District. The major road leading to South Ossetia from the rest of Georgia passes through the Gori District. The legislation, however, also lists "special" cases in which entry into the breakaway regions will not be regarded as illegal. It stipulates that a special permit on entry into the breakaway regions can be issued if the trip there "serves Georgia’s state interests; peaceful resolution of the conflict; de-occupation or humanitarian purposes." The law also bans any type of economic activity – entrepreneurial or non-entrepreneurial, if such activities require permits, licenses or registration in accordance with Georgian legislation. It also bans air, sea and railway communications and international transit via the regions, mineral exploration and money transfers. The provision covering economic activities is retroactive, going back to 1990. The law says that the Russian Federation – the state which has carried out military occupation – is fully responsible for the violation of human rights in Abkhazia and South Ossetia. The Russian Federation, according to the document, is also responsible for compensation of material and moral damage inflicted on Georgian citizens, stateless persons and foreign citizens, who are in Georgia and enter the occupied territories with appropriate permits. The law also says that de facto state agencies and officials operating in the occupied territories are regarded by Georgia as illegal. The law will remain in force until "the full restoration of Georgian jurisdiction" over the breakaway regions is realised. Currently Georgia considers all residents of Abkhazia its citizens, while they see themselves as Abkhaz citizens. In the summer of 2011 the Parliament of Georgia adopted a package of legislative amendments providing for the issuance of neutral identification and travel documents to residents of Abkhazia and the former South Ossetian autonomous province of Georgia. The document allows travelling abroad as well as enjoying social benefits existing in Georgia. The new neutral identification and travel documents were called "neutral passports". According to Georgian officials, the "neutral passports" lacked any symbols of Georgia and only bore a registration number and an individual number. Moscow argued it was Georgia's "cunning ploy" because the passports contained Georgia's code and the Georgian Interior Ministry as the issuing body. Abkhazia's Foreign Ministry expressed concerns about some countries recognising the "neutral passports." The ministry also said an increasing number of Abkhazian residents with Russian passports were being denied Schengen visas. As of May 2013, neutral documents have been recognised by Japan, the Czech Republic, Latvia, Lithuania, Slovakia, the United States, Bulgaria, Poland, Israel, Estonia and Romania. According to Russian media, the President of Republic of Abkhazia, Alexander Ankvab threatened international organisations that accepted neutral passports, saying during a meeting with the leadership of the foreign ministry that "international organizations that suggest the so-called neutral passports, will leave Abkhazia." The leaders of Abkhazia, Russia and South Ossetia, shortly after the 2008 war. Left to right: South Ossetian President Eduard Kokoity; Russian President Dmitry Medvedev; Russian Foreign Minister Sergey Lavrov; Abkhazian President Sergei Bagapsh. During the Georgian–Abkhaz conflict, the Russian authorities and military supplied logistical and military aid to the separatist side. Today, Russia still maintains a strong political and military influence over separatist rule in Abkhazia. Russia has also issued passports to the citizens of Abkhazia since 2000 (as Abkhazian passports cannot be used for international travel) and subsequently paid them retirement pensions and other monetary benefits. More than 80% of the Abkhazian population had received Russian passports by 2006. As Russian citizens living abroad, Abkhazians do not pay Russian taxes or serve in the Russian Army. About 53,000 Abkhazian passports have been issued as of May 2007. Moscow, at certain times, hinted that it might recognise Abkhazia and South Ossetia when Western countries recognised the independence of Kosovo, suggesting that they had created a precedent. Following Kosovo's declaration of independence, the Russian parliament released a joint statement reading: "Now that the situation in Kosovo has become an international precedent, Russia should take into account the Kosovo scenario... when considering ongoing territorial conflicts." Initially Russia continued to delay recognition of both of these republics. However, on 16 April 2008, the outgoing Russian president Vladimir Putin instructed his government to establish official ties with South Ossetia and Abkhazia, leading to Georgia's condemnation of what it described as an attempt at "de facto annexation" and criticism from the European Union, NATO, and several Western governments. Later in April 2008, Russia accused Georgia of trying to exploit NATO support in order to control Abkhazia by force and announced it would increase its military presence in the region, pledging to retaliate militarily against Georgia's efforts. The Georgian Prime Minister Lado Gurgenidze said Georgia will treat any additional troops in Abkhazia as "aggressors". In response to the Georgian invasion of South Ossetia, the Federal Assembly of Russia called an extraordinary session for 25 August 2008 to discuss recognition of Abkhazia and South Ossetia. Following a unanimous resolution that was passed by both houses of the parliament calling on the Russian president to recognise independence of the breakaway republics, Russian president, Dmitry Medvedev, officially recognised both on 26 August 2008. Russian recognition was condemned by NATO nations, OSCE and European Council nations due to "violation of territorial integrity and international law". UN Secretary-General Ban Ki-moon stated that sovereign states have to decide themselves whether they want to recognise the independence of disputed regions. Russia has started work on the establishment of a naval base in Ochamchire by dredging the coast to allow the passage of their larger naval vessels. 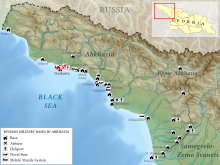 As a response to the Georgian sea blockade of Abkhazia, in which the Georgian coast guard had been detaining ships heading to and from Abkhazia, Russia began patrolling the Black Sea to protect Abkhazia-transiting ships and detaining Georgian ships navigating Abkhazian waters. The extent of Russian influence in Abkhazia has caused some locals to say Abkhazia is under full Russian control, but they still prefer Russian influence over Georgian. The UN has played various roles during the conflict and peace process: a military role through its observer mission (UNOMIG); dual diplomatic roles through the Security Council and the appointment of a Special Envoy, succeeded by a Special Representative to the Secretary-General; a humanitarian role (UNHCR and UNOCHA); a development role (UNDP); a human rights role (UNHCHR); and a low-key capacity and confidence-building role (UNV). The UN's position has been that there will be no forcible change in international borders. Any settlement must be freely negotiated and based on autonomy for Abkhazia legitimised by referendum under international observation once the multiethnic population has returned. According to Western interpretations the intervention did not contravene international law since Georgia, as a sovereign state, had the right to secure order on its territory and protect its territorial integrity. The OSCE has increasingly engaged in dialogue with officials and civil society representatives in Abkhazia, especially from non-governmental organisations (NGO)s and the media, regarding human dimension standards in the region and is considering a presence in Gali. The OSCE expressed concern and condemnation over ethnic cleansing of Georgians in Abkhazia during the 1994 Budapest Summit Decision and later at the Lisbon Summit Declaration in 1996. The USA rejects the unilateral secession of Abkhazia and urges its integration into Georgia as an autonomous unit. In 1998 the USA announced its readiness to allocate up to $15 million for rehabilitation of infrastructure in the Gali region if substantial progress is made in the peace process. USAID has already funded some humanitarian initiatives for Abkhazia. The USA has in recent years significantly increased its military support to the Georgian armed forces but has stated that it would not condone any moves towards peace enforcement in Abkhazia. On 22 August 2006, Senator Richard Lugar, then visiting Georgia's capital Tbilisi, joined Georgian politicians in criticism of the Russian peacekeeping mission, stating that "the U.S. administration supports the Georgian government’s insistence on the withdrawal of Russian peacekeepers from the conflict zones in Abkhazia and the Tskhinvali district". On 5 October 2006, Javier Solana, the High Representative for the Common Foreign and Security Policy of the European Union, ruled out the possibility of replacing the Russian peacekeepers with the EU force. On 10 October 2006, EU South Caucasus envoy Peter Semneby noted that "Russia's actions in the Georgia spy row have damaged its credibility as a neutral peacekeeper in the EU's Black Sea neighbourhood." On 13 October 2006, the UN Security Council unanimously adopted a resolution, based on a Group of Friends of the Secretary-General draft, extending the UNOMIG mission until 15 April 2007. Acknowledging that the "new and tense situation" resulted, at least in part, from the Georgian special forces' operation in the upper Kodori Valley, the resolution urged the country to ensure that no troops unauthorised by the Moscow ceasefire agreement were present in that area. It urged the leadership of the Abkhaz side to address seriously the need for a dignified, secure return of refugees and internally displaced persons and to reassure the local population in the Gali district that their residency rights and identity will be respected. The Georgian side is "once again urged to address seriously legitimate Abkhaz security concerns, to avoid steps that could be seen as threatening and to refrain from militant rhetoric and provocative actions, especially in upper Kodori Valley." Calling on both parties to follow up on dialogue initiatives, it further urged them to comply fully with all previous agreements regarding non-violence and confidence-building, in particular those concerning the separation of forces. Regarding the disputed role of the peacekeepers from the Commonwealth of Independent States (CIS), the Council stressed the importance of close, effective cooperation between UNOMIG and that force and looked to all sides to continue to extend the necessary cooperation to them. At the same time, the document reaffirmed the "commitment of all Member States to the sovereignty, independence and territorial integrity of Georgia within its internationally recognised borders." The HALO Trust, an international non-profit organisation that specialises in the removal of the debris of war, has been active in Abkhazia since 1999 and has completed the removal of landmines in Sukhumi and Gali districts. It declared Abkhazia "mine free" in 2011. The main NGO working in Abkhazia is the France-based international NGO Première-Urgence (PU): PU has been implementing rehabilitation and economical revival programmes to support the vulnerable populations affected by the frozen conflict for almost 10 years. Russia does not allow the European Union Monitoring Mission (EUMM) to enter Abkhazia. Abkhazia was an unrecognised state for most of its history. The following is a list of political entities that formally recognise Abkhazia. Russia recognised Abkhazia on 26 August 2008 after the Russo-Georgian War. Nicaragua recognised Abkhazia on 5 September 2008. Venezuela recognised Abkhazia on 10 September 2009. Nauru recognised Abkhazia on 15 December 2009. Syria recognized Abkhazia on 29 May 2018. South Ossetia recognised Abkhazia on 17 November 2006. Transnistria recognised Abkhazia on 17 November 2006. Republic of Artsakh recognised Abkhazia on 17 November 2006. Vanuatu recognised Abkhazia on 23 May 2011, but withdrew recognition on 20 May 2013. Tuvalu recognised Abkhazia on 18 September 2011  but withdrew recognition on 31 March 2014. "View of Mount Agepsta and Turyi gory (Tur Mountains) from the top of Kamennyi Stolb, Aibga Ridge. ", 2014. Abkhazia covers an area of about 8,660 km2 (3,344 sq mi) at the western end of Georgia. The Caucasus Mountains to the north and the northeast divide Abkhazia and the Russian Federation. To the east and southeast, Abkhazia is bounded by the Georgian region of Samegrelo-Zemo Svaneti; and on the south and southwest by the Black Sea. 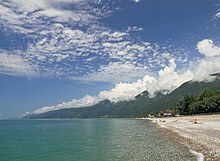 Abkhazia is diverse geographically with lowlands stretching to the extremely mountainous north. The Greater Caucasus Mountain Range runs along the region's northern border, with its spurs – the Gagra, Bzyb and Kodori ranges – dividing the area into a number of deep, well-watered valleys. 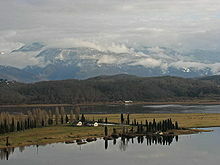 The highest peaks of Abkhazia are in the northeast and east and several exceed 4,000 meters (13,123 ft) above sea level. Abkhazia's landscape ranges from coastal forests and citrus plantations to permanent snows and glaciers in the north of the region. Although Abkhazia's complex topographic setting has spared most of the territory from significant human development, its cultivated fertile lands produce tea, tobacco, wine and fruits, a mainstay of the local agricultural sector. Abkhazia is richly irrigated by small rivers originating in the Caucasus Mountains. Chief of these are: Kodori, Bzyb, Ghalidzga, and Gumista. The Psou River separates the region from Russia, and the Inguri serves as a boundary between Abkhazia and Georgia proper. There are several periglacial and crater lakes in mountainous Abkhazia. Lake Ritsa is the most important of them. The world's deepest known cave, Veryovkina Cave, is located in Abkhazia's western Caucasus mountains. The latest survey (as of March 2018) has measured the vertical extent of this cave system as 2,212 meters (7,257 ft) between its highest and lowest explored points. Because of Abkhazia's proximity to the Black Sea and the shield of the Caucasus Mountains, the region's climate is very mild. The coastal areas of the republic have a subtropical climate, where the average annual temperature in most regions is around 15 °C (59 °F), and the average January temperature remains above freezing. The climate at higher elevations varies from maritime mountainous to cold and summerless. Also, due to its position on the windward slopes of the Caucasus, Abkhazia receives high amounts of precipitation, though humidity decreases further inland. The annual precipitation vacillates from 1,200–1,400 mm (47.2–55.1 in) along the coast 1,700–3,500 mm (66.9–137.8 in) in the higher mountainous areas. The mountains of Abkhazia receive significant amounts of snow. The lowland regions used to be covered by swaths of oak, beech, and hornbeam, which have since been cleared. There are two main entrances into Abkhazia. The southern entrance is at the Inguri bridge, a short distance from the city of Zugdidi. The northern entrance ("Psou") is in the town of Leselidze. Owing to the situation with a recognition controversy, many foreign governments advise their citizens against travelling to Abkhazia. According to President Raul Khajimba, over the summer of 2015, thousands of tourists visited Abkhazia. Abkhazia is a semi-presidential republic, and the second elected President of Abkhazia was Sergei Bagapsh. Bagapsh came to power following the deeply divisive October 2004 presidential election. The next election was held on 12 December 2009. Bagapsh was re-elected as president with 59.4% of the total vote. Alexander Ankvab, his vice president, was appointed acting president after the former president's death on 29 May 2011 until winning election in his own right later on 26 August 2011. Legislative powers are vested in the People's Assembly, which consists of 35 elected members. The last parliamentary elections were held on 10/24 March 2012. Ethnicities other than Abkhaz (Armenians, Russians and Georgians) are claimed to be under-represented in the Assembly. Most refugees from the 1992–1993 war (mainly ethnic Georgians) have not been able to return and have thus been excluded from the political process. Abkhazian officials have stated that they have given the Russian Federation the responsibility of representing their interests abroad. According to a 2010 study published by the University of Colorado Boulder, the vast majority of Abkhazia's population supports independence, while a smaller number is in favour of joining the Russian Federation. Support for a reunification with Georgia is very low. Even among ethnic Georgians, nearly 50% prefer Abkhazia to remain an independent state and less than 20% of them believe returning to Georgia is necessary, as most of them have adjusted to the current situation. Among ethnic Abkhaz, explicit support for reunification with Georgia is around 1%; a similar figure can be found among ethnic Russians and Armenians as well. Logo of the Government of the Autonomous Republic of Abkhazia. The Government of the Autonomous Republic of Abkhazia is the government in exile that Georgia recognises as the legal government of Abkhazia. This pro-Georgian government maintained a foothold on Abkhazian territory, in the upper Kodori Valley from July 2006 until it was forced out by fighting in August 2008. This government is also partly responsible for the affairs of some 250,000 IDPs, forced to leave Abkhazia following the War in Abkhazia and ethnic cleansing that followed. The current Head of the Government is Vakhtang Kolbaia. During the War in Abkhazia, the Government of the Autonomous Republic of Abkhazia (at the time the Georgian faction of the "Council of Ministers of Abkhazia") left Abkhazia after the Abkhaz separatist forces took control of the region's capital Sukhumi and relocated to Georgia's capital Tbilisi where it operated as the Government of Abkhazia in exile for almost 13 years. During this period, the Government of Abkhazia in exile, led by Tamaz Nadareishvili, was known for a hard-line stance towards the Abkhaz problem and frequently voiced their opinion that the solution to the conflict can be attained only through Georgia's military response to secessionism. Later, Nadareishvili's administration was implicated in some internal controversies and had not taken an active part in the politics of Abkhazia until a new chairman, Irakli Alasania, was appointed by President of Georgia, Mikheil Saakashvili, his envoy in the peace talks over Abkhazia. 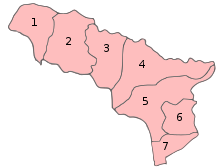 The Republic of Abkhazia is divided into seven raions named after their primary cities: Gagra, Gudauta, Sukhumi, Ochamchira, Gulripshi, Tkvarcheli and Gali. These districts remain mostly unchanged since the breakup of the Soviet Union, with the exception of the Tkvarcheli district, created in 1995 from parts of the Ochamchira and Gali districts. The President of the Republic appoints districts' heads from those elected to the districts' assemblies. There are elected village assemblies whose heads are appointed by the districts' heads. The administrative subdivision of Abkhazia used by Georgia is identical to the one outlined above, except for the new Tkvarcheli district. The Abkhazian Armed Forces are the military of the Republic of Abkhazia. The basis of the Abkhazian armed forces was formed by the ethnically Abkhaz National Guard, which was established in early 1992. Most of their weapons come from the former Russian airborne division base in Gudauta. The Abkhazian military is primarily a ground force, but includes small sea and air units. Russia has at present around 1,600 troops stationed in Abkhazia. The Abkhazian Land Forces with a permanent force of around 5,000, but with reservists and paramilitary personnel this may increase to up to 50,000 in times of military conflict. The exact numbers and the type of equipment used remain unverifiable. The Abkhazian Navy that consists of three divisions based in Sukhumi, Ochamchire and Pitsunda, but the Russian coast guard patrols their waters. The Abkhazian Air Force, a small unit consisting of a few fighter aircraft and helicopters. The economy of Abkhazia is heavily integrated with Russia and uses the Russian ruble as its currency. Abkhazia has experienced a modest economic upswing since the 2008 South Ossetia war and Russia's subsequent recognition of Abkhazia's independence. About half of Abkhazia's state budget is financed with aid money from Russia. Tourism is a key industry and, according to Abkhazia's authorities, almost a million tourists (mainly from Russia) came to Abkhazia in 2007. Abkhazia also enjoys fertile lands and an abundance of agricultural products, including tea, tobacco, wine and fruits (especially tangerines and hazelnuts). Electricity is largely supplied by the Inguri hydroelectric power station located on the Inguri River between Abkhazia and Georgia (proper) and operated jointly by both parties. In the first half of 2012, the principal trading partners of Abkhazia were Russia (64%) and Turkey (18%). The CIS economic sanctions imposed on Abkhazia in 1996 are still formally in force, but Russia announced on 6 March 2008 that it would no longer participate in them, declaring them "outdated, impeding the socio-economic development of the region, and causing unjustified hardship for the people of Abkhazia". Russia also called on other CIS members to undertake similar steps, but met with protests from Tbilisi and lack of support from the other CIS countries. Despite the controversial status of the territory and its damaged infrastructure, tourism in Abkhazia grew following the Russian recognition of Abkhazian independence in 2008 due to the arrival of Russian tourists. In 2009 the number of Russian tourists in Abkhazia increased by 20% and the total number of Russian tourists reached 1 million. Low prices and an absence of any visa requirements attracts Russian tourists especially those who cannot afford vacations in Turkey, Egypt, Bulgaria and other popular Russian tourist destinations. After the tourist boom many Russian businesses began to invest money in Abkhazian tourist infrastructure. With the main highway of the country being rebuilt in 2014 many damaged hotels in Gagra are either being restored or demolished. In 2014, 1.16 million Russian tourists visited Abkhazia. According to the last census in 2011 Abkhazia has 240,705 inhabitants. The exact size of Abkhazia's population was unclear. According to the census carried out in 2003 it measured 215,972 people, but this is contested by Georgian authorities. The Department of Statistics of Georgia estimated Abkhazia's population to be approximately 179,000 in 2003, and 178,000 in 2005 (the last year when such estimates were published in Georgia). Encyclopædia Britannica estimates the population in 2007 at 180,000 and the International Crisis Group estimates Abkhazia's total population in 2006 to be between 157,000 and 190,000 (or between 180,000 and 220,000 as estimated by UNDP in 1998). The ethnic composition of Abkhazia has played a central role in the Georgian-Abkhazian conflict and is equally contested. The demographics of Abkhazia were very strongly affected by the 1992–1993 War with Georgia, which saw the expulsion and flight of over half of the republic's population, measuring 525,061 in the 1989 census. The population of Abkhazia remains ethnically very diverse, even after the 1992–1993 War. At present the population of Abkhazia is mainly made up of ethnic Abkhaz (50.8% according to the 2011 census), Georgians (mostly Mingrelians), Hemshin Armenians, and Russians. Other ethnicities include Ukrainians, Belarusians, Greeks, Ossetians, Tatars, Turks, and Roma. Greeks constituted a significant minority in the area in the early 1920s (50,000), and remained a major ethnic component until 1945 when they were deported to Central Asia. Under the Soviet Union, the Russian, Armenian, and Georgian populations grew faster than the Abkhaz population, due to large-scale enforced migration, especially under the rule of Joseph Stalin and Lavrenty Beria. Russians moved into Abkhazia in great numbers. In the wake of the Syrian Civil War Abkhazia granted refugee status to a few hundred Syrians with Abkhaz, Abazin and Circassian ancestry. Facing a growing Armenian community, this move has been linked with the wish of the ruling Abkhaz —who have often been in the minority on their territory— to tilt the demographic balance in favour of the titular nation. Thousands of Abkhaz, known as muhajirun, fled Abkhazia for the Ottoman Empire in the mid-19th century after resisting the Russian conquest of the Caucasus. Today, Turkey is home to the world's largest Abkhaz diaspora community. Size estimates vary – Diaspora leaders say 1 million people; Abkhaz estimates range from 150,000 to 500,000. 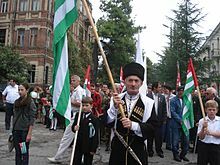 Most inhabitants of Abkhazia are Christian (Eastern Orthodox and Armenian Apostolic) or Sunni Muslim. The Abkhaz Native Religion has undergone a strong revival in recent decades. There is a very small number of adherents of Judaism, Jehovah's Witnesses and new religious movements. The Jehovah's Witnesses organisation has officially been banned since 1995, though the decree is not currently enforced. According to the constitutions of both Abkhazia and Georgia, the adherents of all religions have equal rights before the law. According to a survey held in 2003, 60% of respondents identified themselves as Christian, 16% as Muslim, 8% as atheist or irreligious, 8% as adhering to the traditional Abkhazian religion or as Pagan, 2% as follower of other religions and 6% as undecided. The official language of the Republic of Abkhazia shall be the Abkhazian language. The Russian language, equally with the Abkhazian language, shall be recognized as a language of State and other institutions. The State shall guarantee the right to freely use the mother language for all the ethnic groups residing in Abkhazia. The languages spoken in Abkhazia are Abkhaz, Russian, Mingrelian, Svan, Armenian, and Greek. The Autonomous Republic passed a law in 2007 defining the Abkhaz language as the only state language of Abkhazia. As such, Abkhaz is the required language for legislative and executive council debates (with translation from and to Russian) and at least half of the text of all magazines and newspapers must be in Abkhaz. Despite the official status of Abkhaz, the dominance of other languages within Abkhazia, especially Russian, is so great that experts as recently as 2004 called it an "endangered language". During the Soviet era, language instruction would begin in schools in Abkhaz, only to switch to Russian for the majority of required schooling. The government of the Republic is attempting to institute Abkhaz-only primary education but there has been limited success due to a lack of facilities and educational materials. Even in Georgian-speaking areas of the Republic, ending schooling in that language has resulted in teachers switching to Russian-language materials instead of Abkhaz-language teaching. After the breakup of Soviet Union, many Abkhazians kept their Soviet passports, even after a decade, and used them to eventually apply for Russian citizenship. Before 2002, Russian law allowed residents of former Soviet Union to apply for citizenship if they had not become citizens of their newly independent states. The procedure was extremely complex. The new citizenship law of Russia adopted on 31 May 2002 introduced a simplified procedure of citizenship acquisition for former citizens of the Soviet Union regardless of their place of residence. In Abkhazia and South Ossetia, the application process was simplified even further, and people could apply even without leaving their homes. Russian nationalist non-governmental organisations with close ties to Russian officialdom simply took their papers to a nearby Russian city for processing. Abkhazians began mass acquisition of Russian passports in 2002. It is reported that the public organisation the Congress of Russian Communities of Abkhazia started collecting Abkhazians’ Soviet-era travel documents. It then sent them to a consular department specially set up by Russian Foreign Ministry officials in the city of Sochi. After they were checked, Abkhazian applicants were granted Russian citizenship. By 25 June 2002, an estimated 150,000 people in Abkhazia had acquired the new passports, joining 50,000 who already possessed Russian citizenship. The Sukhum authorities, although officially not involved in the registration for Russian nationality process, openly encouraged it. Government officials said privately that President Putin's administration agreed with the passport acquisition during Abkhazia's prime minister Djergenia's visit to Moscow in May 2002. The "passportisation" caused outrage in Tbilisi, worsening its already shaky relations with Russia. The Georgian Foreign Ministry issued a statement insisting that Abkhazians were citizens of Georgia and calling the passport allocation an "unprecedented illegal campaign". President Eduard Shevardnadze said that he would be asking his Russian counterpart, Vladimir Putin, for an explanation. The speaker of parliament Nino Burjanadze said that she would raise the matter at the forthcoming OSCE parliamentary assembly. 1 February 2011 was the last day in the post-Soviet era when a passport of USSR was valid for crossing the Russian-Abkhaz border. According to the staff of Abkhazia's passport and visa service, there were about two to three thousand mostly elderly people left with Soviet passports who had no chance of acquiring new documents. These people were not able to get Russian citizenship. But they can first get an internal Abkhaz passport and then a travelling passport to visit Russia. In 2005, citing the need to integrate ethnic Georgian residents of eastern districts of Abkhazia, the then leadership of Abkhazia showed signs of a softening stance towards granting of citizenship to the residents of Gali, Ochamchire and Tkvarcheli districts. According to the Abkhazian law on citizenship, ethnic Abkhazians, regardless of place of residence, can become Abkhaz citizens. Those who are not ethnic Abkhazians are eligible for citizenship if they lived in Abkhazia for at least five years prior to adoption of act of independence in October, 1999. This provision aimed at creating a legal hurdle in obtaining Abkhaz passports for those ethnic Georgians who fled Abkhazia as a result of 1992–1993 armed conflict and who then returned to the Gali district. Abkhazian legislation forbids citizens of Abkhazia from holding dual citizenship with any other state apart from Russia. Ethnic Georgians who have returned to the Gali district and want to obtain Abkhaz passports, according to Abkhazian law, should undergo lengthy procedures which also include a requirement to submit documented proof that they renounced their Georgian citizenship. President Bagapsh was inclined to regard Georgians in Gali as "Georgianised Abkhazians." According to Bagapsh, these were actually ethnic Abkhaz people who were "Georgianised" during the long process of the Georgianisation of Abkhazia that culminated during the rule of Joseph Stalin and Lavrenti Beria. So in his official speeches, Bagapsh often added the Gali Georgians to population estimates of the Abkhaz, disregarding the fact that they still thought of themselves as ethnic Georgians rather than Abkhaz. In early 2013 the process of passportisation of ethnic Georgians came under the scrutiny of Abkhaz opposition groups who turned this issue into one of the central topics of the breakaway region's internal politics, and issuing of passports was suspended in May. Opposition claimed that "massive" passportisation involving granting citizenship to ethnic Georgians in eastern districts was fraught with risk of "losing sovereignty and territorial integrity." According to Apsnipress, Stanislav Lakoba, secretary of Abkhaz security council, said that "We are facing the process of the total Georgianization of Abkhazia." Pressures have been placed upon teachers in areas of Abkhazia which retain large Georgian populations to abandon the use of the Georgian language in education and adopt Russian textbooks. On 18 September 2013, the Parliament of Republic of Abkhazia adopted a resolution instructing the prosecutor's office to carry out a "sweeping" probe into passport offices of the interior ministry and where wrongdoings were found in the distribution of passports to refer those violations to the Ministry of Internal Affairs for "annulment of illegally issued passports." Abkhaz officials announced that a significant number of residents of Gali, Ochamchire and Tkvarcheli districts received Abkhaz passports while at the same time retaining their Georgian citizenship, which constituted a "violation of the law on Abkhaz citizenship". According to the Abkhaz officials, more than 26,000 passports were distributed in Gali, Tkvarcheli and Ochamchire districts, including about 23,000 of which were given out since Russian recognition of Abkhazia's independence in August, 2008. These political debates have caused concerns in the ethnic Georgian population of Abkhazia, who reside mainly in Gali district, that they would be stripped of Abkhazian citizenship and thus forced to leave Abkhazia again. In October 2013 Alexander Ankvab signed a document ordering the firing of Stanislav Lakoba. The document did not state any reason for the decision but Lakoba saw it as related to his political position on granting citizenship to Georgians living in Gali. Lakoba claimed that, according to data from the Abkhaz Security Council, 129 local people in Gali fought against Abkhazia. Local political parties and the coordination council of civil organisations expressed concern about Lakoba's dismissal. They claimed that, by dismissing him, the president "made an illegal process legal" – giving Abkhazian passports to Georgian citizens. The written Abkhaz literature appeared relatively recently, in the beginning of the 20th century. However, Abkhaz share the Nart sagas, a series of tales about mythical heroes, with other Caucasian peoples. The Abkhaz alphabet was created in the 19th century. The first newspaper in Abkhaz, called Abkhazia and edited by Dmitry Gulia, appeared in 1917. Arguably the most famous Abkhaz writers are Fazil Iskander, who wrote mostly in Russian, and Bagrat Shinkuba, a poet. Football remains the most popular sport in Abkhazia. Other popular sports include basketball, boxing and wrestling. The National Basketball Team of Abkhazia played its first game with the Turkish Republic of Northern Cyprus Basketball team on 27 May 2015, which Abkhaz team won by 76-59. Abkhaz basketball team "Apsny" also plays in the Russian Basketball League's Third-Tier in Krasnodar Krai. Abkhazia has had its own amateur Abkhazian football league since 1994 though it has no international football union membership.In total, there are nineteen Abkhazian Football Clubs across the two leagues. In 2016 it hosted and won the ConIFA World Football Cup. ^ Site programming: Denis Merkushev. "Акт о государственной независимости Республики Абхазия". Abkhaziagov.org. Archived from the original on 20 May 2008. Retrieved 22 June 2010. ^ "Апсныпресс – государственное информационное агенство Республики Абхазия". Apsnypress.info. Archived from the original on 28 May 2010. Retrieved 22 June 2010. ^ "Abkhazia: Review of Events for the Year 1996". UNPO. 31 January 1997. Archived from the original on 5 June 2010. Retrieved 22 June 2010. ^ a b c d e f g h i j k l Hoiberg, Dale H., ed. (2010). "Abkhazia". Encyclopedia Britannica. I: A-ak Bayes (15th ed.). Chicago, IL: Encyclopedia Britannica Inc. p. 33. ISBN 978-1-59339-837-8. ^ a b "Численность наличного населения (на начало года)". Abkhazian State Statistics Office. Archived from the original on 28 April 2018. Retrieved 27 April 2018. ^ "Abkhazia calculated GDP – News". GeorgiaTimes.info. 7 July 2010. Archived from the original on 24 July 2011. Retrieved 22 September 2011. ^ "Abkhazia remains available by Georgian phone codes". today.az. 6 January 2010. Archived from the original on 12 July 2012. Retrieved 20 January 2010. ^ "World Telephone Numbering Guide". wtng.info. Archived from the original on 20 December 2013. Retrieved 23 June 2014. ^ a b "Constitution of the Republic of Abkhazia (Apsny)". Abkhazworld.com. Archived from the original on 24 June 2016. Retrieved 31 May 2016. ^ Olga Oliker, Thomas S. Szayna. Faultlines of Conflict in Central Asia and the South Caucasus: Implications for the U.S. Army. Rand Corporation, 2003, ISBN 978-0-8330-3260-7. ^ Clogg, Rachel (January 2001). "Abkhazia: ten years on". Conciliation Resources. Archived from the original on 2 March 2008. Retrieved 31 May 2016. ^ Emmanuel Karagiannis. Energy and Security in the Caucasus. Routledge, 2002. ISBN 978-0-7007-1481-0. ^ "Территориальная целостность Грузии опирается на твердую международную поддержку". golos-ameriki.ru. Archived from the original on 19 September 2018. Retrieved 4 October 2018. ^ "Contested Borders in the Caucasus : Chapter I (3/4)". vub.ac.be. Archived from the original on 27 November 2012. Retrieved 10 February 2014. ^ Ozgan, Konstantin (1998). "Abkhazia: Problems and the Paths to their Resolution". In Ole Høiris, Sefa Martin Yürükel (ed.). Contrasts and Solutions in the Caucasus. Aarhus University Press. p. 184. ISBN 978-87-7288-708-1. Archived from the original on 27 February 2015. Retrieved 27 February 2015. [...] Apsny, which when translated, means 'Land of the Abkhazians [Mortals]' [...] See Chirikba (1991) for the etymology deriving the Abkhazian native ethnonym from the root 'die' in the sense of 'mortal being'. The popular belief that the toponym is etymologisable as 'Land of the Soul' is demonstrated by Chirikba to be no longer tenable. ^ Hewitt, George B. (2013). Discordant Neighbours: A Reassessment of the Georgian-Abkhazian and Georgian-South Ossetian Conflicts. BRILL. p. 9. ISBN 90-04-24893-5. Archived from the original on 17 November 2016. Retrieved 30 November 2016. ^ Otar Kajaia, 2001–2004, Megrelian–Georgian Dictionary Archived 2 March 2016 at the Wayback Machine (entry abzhua). ^ Otar Kajaia, 2001–2004, Megrelian–Georgian Dictionary Archived 2 March 2016 at the Wayback Machine (entry saapxazo). ^ Braund, David (1994), Georgia in Antiquity: A History of Colchis and Transcaucasian Iberia, 550 BC – AD 562, Oxford: Clarendon, p. 359 . ^ Grigor, Ronald, The Making of the Georgian Nation, SUNY, p. 13 . ^ Kaufman, Stuart J, Modern Hatreds: The Symbolic Politics of Ethnic War, p. 91 . ^ a b c d e "BBC News – Regions and territories: Abkhazia". BBC News. London: BBC. 22 November 2011. Archived from the original on 3 March 2012. Retrieved 19 January 2012. ^ Braund, David (8 September 1994), Georgia in Antiquity: A History of Colchis and Transcaucasian Iberia, 550 BC – AD 562, USA: Oxford University Press, p. 27 . ^ Gregory, Timothy E (2005), A History of Byzantium, p. 78, ISBN 978-0-631-23512-5 . ^ Graham Smith, Edward A. Allworth, Vivien A. Law et al., pages 56-58; Abkhaz by W. Barthold V. Minorsky in the Encyclopaedia of Islam. ^ Olson, James S; Pappas, Lee Brigance; Pappas, Nicholas C. J. An Ethnohistorical Dictionary of the Russian and Soviet Empires. Geenwood. p. 6. ISBN 978-0-313-27497-8. ^ a b Odisheli 2018, pp. 1-2. ^ Smith, Graham; Vivien Law (1998). Nation-building in the post-Soviet borderlands. Cambridge University Press. p. 56. ISBN 978-0-521-59968-9. ^ Alexei Zverev, Ethnic Conflicts in the Caucasus; Graham Smith, Edward A Allworth, Vivien A Law et al., pages 56–58; Abkhaz by W. Barthold [V. Minorsky] in the Encyclopaedia of Islam; The Georgian-Abkhaz State (summary), by George Anchabadze, in: Paul Garb, Arda Inal-Ipa, Paata Zakareishvili, editors, Aspects of the Georgian-Abkhaz Conflict: Cultural Continuity in the Context of Statebuilding, Volume 5, 26–28 August 2000. ^ a b Beradze, T.; Topuria, K.; Khorava, B. (2009). "A Historical-Geographical Review of Modern Abkhazia in:Causes of War-Prospects for Peace. Proceedings of the Holy Synod of the Georgian Orthodox Church and the Konrad-Adenauer-Stiftung scientific conference on the theme: Causes of War - Prospects for Peace (2008), 2–3 December: CGS ltd" (PDF). www.kas.de. pp. 10–12. Archived (PDF) from the original on 5 March 2016. Retrieved 19 September 2015. ^ Mikaberidze, A. (2007). "HIstory". Georgia: Past, Present and Future. Archived from the original on 16 October 2015. Retrieved 19 September 2015. ^ Houtsma, M. Th. ; E. van Donzel (1993). E.J. Brill's first encyclopaedia of Islam 1913–1936. BRILL. p. 71. ISBN 978-90-04-09796-4. ^ Lortkipanidze M., The Abkhazians and Abkhazia, Tbilisi 1990. ^ a b c "Some of the issues of Russian imperial language policy in Abkhazia and its results (part II)". Experts' Club. 28 July 2010. Archived from the original on 21 February 2014. Retrieved 14 February 2014. ^ Из конституции Социалистической Советской Республики Абхазии [From the Constitution of the Soviet Socialist Republic of Abkhazia] (in Russian). 1 April 1925. Article 3. Archived from the original on 14 November 2002. ^ Neproshin, A. Ju. (16–17 May 2006), Archived copy Абхазия. Проблемы международного признания [Abkhazia. Problems of international recognition] (in Russian), MGIMO, archived from the original on 3 September 2008, retrieved 2 September 2008 CS1 maint: Archived copy as title (link). ^ Eastern Europe and the Commonwealth of Independent States. London: Europa Publications Limited. 1999. p. 363. ISBN 978-1-85743-058-5. ^ Hewitt, George (1999). The Abkhazians: a handbook. Palgrave Macmillan. p. 96. ISBN 978-0-312-21975-8. ^ a b Shenfield, Stephen D., ed. (May 2004). "Special Issue; The Georgian-Abkhaz Conflict: Past, Present, Future". JRL Research & Analytical Supplement ~ JRL 8226. Cdi.org (24). Archived from the original on 6 July 2010. Retrieved 22 June 2010. ^ Hewitt, George, Abkhaz – A Comprehensive Self-Tutor, p. 17 . ^ The Stalin-Beria Terror in Abkhazia, 1936-1953, by Stephen D. Shenfield Archived 10 September 2015 at the Wayback Machine Abkhaz World, 30 June 2010, retrieved 11 September 2015. ^ ЗАКЛЮЧЕНИЕ: Государственной комиссии Грузии по установлению фактов политики этнической чистки — геноцида, проводимой в отношении грузинского населения Абхазии, Грузия, и передачи материалов в Международный трибунал [CONCLUSION: State Commission of Georgia on established facts of the politics of ethnic cleansing - genocide carried out against the Georgian population of Abkhazia, Georgia, and the transfer of materials to the International Tribunal] (in Russian). geocities.com. February 1997. Archived from the original on 27 October 2009. ^ Céline., Francis, (2011). Conflict Resolution and Status : the Case of Georgia and Abkhazia (1989-2008). Bruxelles: ASP. ISBN 9789054878995. OCLC 922966407. ^ "Georgia: Abkhazia and South Ossetia". www.pesd.princeton.edu. Encyclopedia Princetoniensis. Archived from the original on 4 August 2018. Retrieved 19 April 2019. ^ 1921 Constitution of the Democratic Republic of Georgia Archived 23 May 2011 at the Wayback Machine: Chapter XI, Articles 107–108 (adopted by the Constituent Assembly of Georgia 21 February 1921): "Abkhasie (district of Soukhoum), ..., which are integral parts of the Georgian Republic, enjoy autonomy in the administration of their affairs. The statute concerning the autonomy of [these] districts ... will be the object of special legislation". Regional Research Centre. Retrieved on 25 November 2008. ^ Svante E. Cornell (2001), Small Nations and Great Powers: A Study of Ethnopolitical Conflict in the Caucasus, pp. 345–9. Routledge, ISBN 978-0-7007-1162-8. ^ C.J.Shivers (15 September 2004). "The Chechen's Story: From Unrivaled Guerrilla Leader to the Terror of Russia". The New York Times. New York Times. Archived from the original on 28 May 2015. Retrieved 6 April 2011. ^ "UNOMIG: United Nations Observer Mission in Georgia - Background". un.org. Archived from the original on 19 May 2017. Retrieved 28 June 2017. ^ "CSCE Budapest Document 1994, Budapest Decisions, Regional Issues". .umn.edu. Archived from the original on 7 June 2011. Retrieved 22 June 2010. ^ Население Абхазии: Сухумский военный округ (1886 г.) (без Сухума, Гудаут, Очемчири); ССР АБХАЗИЯ (1926 г. ); Абхазская АССР (1939 г. ); Абхазская АССР (1959 г. ); Абхазская АССР (1970 г. ); Абхазская АССР (1970 г. ); Абхазская АССР (1989 г. ); Республика Абхазия (2003 г.) (по Верхнему Кодору – 2002 г.) [The population of Abkhazia: Sukhumi military district (1886) (without Sukhum, Gudaut, Ochmchiri); SSR ABKHAZIA (1926); The Abkhaz ASSR (1939); The Abkhaz ASSR (1959); The Abkhaz ASSR (1970); The Abkhaz ASSR (1970); The Abkhaz ASSR (1989); The Republic of Abkhazia (2003) (on the Upper Kodor River - 2002)] (in Russian). Archived from the original on 12 September 2008. ^ a b "Europe Report N°176: Abkhazia Today". Crisisgroup.org. 15 September 2006. Archived from the original on 22 February 2014. ^ "World Review - Washington shames Moscow over 'occupied' Abkhazia". www.worldreview.info. Archived from the original on 2 February 2014. ^ Kälin, Walter (24 March 2006). Report of the Representative of the Secretary-General on the human rights of internally displaced persons – Mission to Georgia (21 to 24 December 2005) (PDF) (Report). United Nations. Archived from the original (PDF) on 23 December 2006. ^ "Кавказский Узел - Протокол N 7 Центральной избирательной комиссии по выборам Президента Республики Абхазия от 14 января 2005 г." Кавказский Узел. ^ "Regions and territories: Abkhazia". BBC.co.uk. 15 December 2009. Archived from the original on 20 April 2010. Retrieved 23 April 2010. ^ "Video shows Russian MiG downing Georgian UAV". Airforcetimes.com. 23 April 2008. Archived from the original on 24 July 2009. Retrieved 22 June 2010. ^ Russian Jet shoots Georgian UAV. Youtube. Archived from the original on 6 May 2008. Retrieved 22 June 2010. ^ "Georgia 'started unjustified war'". BBC News. 30 September 2009. Archived from the original on 20 April 2010. Retrieved 20 March 2010. ^ "Report blames Georgia for starting war with Russia: newspapers". Earthtimes.org. 30 September 2009. Archived from the original on 2 October 2009. Retrieved 30 September 2009. ^ "Russia in operation to storm Abkhazia gorge". UK. Reuters. 10 August 2008. Archived from the original on 12 January 2009. Retrieved 22 June 2010. ^ "Russia recognises Abkhazian & South Ossetian independence". Russia today. 27 August 2008. Archived from the original on 11 February 2009. Retrieved 22 June 2010. ^ Nowak, David; Torchia, Christopher (14 August 2008), "Russia: Georgia can 'forget' regaining provinces", ABC News, The Associated Press, archived from the original on 13 September 2008, retrieved 20 September 2008 . ^ "Russia recognises Georgia's breakaway republics -2". Moscow: RIA Novosti. 26 August 2008. Archived from the original on 8 September 2008. Retrieved 9 September 2008. ^ Jean-Christophe Peuch (29 June 2009). "Georgia: OSCE Terminates Its 17-Year Georgian Mission". Eurasianet. Archived from the original on 18 March 2014. Retrieved 18 March 2014. ^ "Resolution of the Parliament of Georgia declaring Abkhazia and South Ossetia occupied territories". Parliament of Georgia. 29 August 2008. Archived from the original on 3 September 2008. ^ "Abkhazia, S.Ossetia Formally Declared Occupied Territory". Civil.Ge. Tbilisi. 28 August 2008. Archived from the original on 23 July 2009. ^ "Abkhaz Leadership, Opposition Exchange Accusations". Caucasus Report. Radio Free Europe. 24 May 2009. Archived from the original on 31 May 2009. Retrieved 6 November 2009. ^ a b Cecire, Michael H. (28 May 2014). "Analysis: Unrest in Abkhazia" (Interview). Interviewed by BBC News. BBC.com. Archived from the original on 11 February 2017. Retrieved 29 November 2016. ^ "Georgia Abkhazia: Leader 'flees' protesters in Sukhumi". BBC News. 28 May 2014. Archived from the original on 29 May 2014. Retrieved 28 May 2014. ^ "Abkhazia parliament appoints chairman as interim president, sets early presidential poll". The Voice of Russia. 31 May 2014. Archived from the original on 1 June 2014. ^ Herszenhorn, David M. (1 June 2014). "President of Georgian Abkhazia Resigns Under Pressure". The New York Times. Archived from the original on 14 September 2017. Retrieved 18 February 2017. ^ "New Abkhaz Leader Takes Office". Civil Georgia. 25 September 2014. Archived from the original on 10 January 2015. Retrieved 9 January 2015. ^ Dahlstrom, Katie (15 November 2014). "Georgians protest against Russia-Abkhazia agreement". BBC.com. Archived from the original on 15 November 2014. Retrieved 15 November 2014. ^ Farchy, Jack (24 November 2014). "Vladimir Putin signs treaty with Abkhazia and puts Tbilisi on edge". Financial Times. Archived from the original on 30 December 2014. Retrieved 9 January 2015. ^ "Putin strengthens ties with Georgia breakaway region; Tbilisi protests". Reuters. 24 November 2014. Archived from the original on 9 January 2015. Retrieved 9 January 2015. ^ Socor, Vladimir (18 February 2004). "Frozen Conflicts in the Black Sea-South Caucasus Region". IASPS Policy Briefings: Geostrategic Perspectives on Eurasia. Washington, D.C.: Institute for Advanced Strategic & Political Studies (52). Archived from the original on 5 June 2013. Retrieved 26 March 2014. ^ a b c Абхазия, Южная Осетия и Приднестровье признали независимость друг друга и призвали всех к этому же [Abkhazia, South Ossetia and Transnistria have recognised each other's independence and have called on all to do the same] (in Russian). Newsru. 17 November 2006. Archived from the original on 16 April 2009. Retrieved 26 August 2008. ^ "Head of Foreign Ministry of the Republic of South Ossetia congratulated Minister of Foreign Affairs of the PMR with Sixth Anniversary of Creation of Community for Democracy and Rights of Nations". 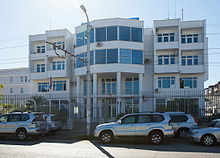 The Ministry of Foreign Affairs of the PMR. 15 June 2012. Archived from the original on 27 March 2014. Retrieved 26 March 2014. ^ Vichos, Ioannis F. ""Moldova's Energy Strategy and the "Frozen Conflict" of Transnistria"". Ekemeuroenergy.org. Archived from the original on 15 June 2013. ^ "Chavez recognises Georgia rebels". BBC News. 10 September 2009. Archived from the original on 20 April 2010. Retrieved 22 June 2010. ^ Chavez Backs Russian Recognition of Georgian Regions Archived 6 June 2009 at the Wayback Machine Reuters. Retrieved 29 August 2008. ^ Harding, Luke (14 December 2009). "Tiny Nauru struts world stage by recognising breakaway republics". The Guardian. London. Archived from the original on 17 December 2009. Retrieved 14 December 2009. ^ "Belarus says to recognise Abkhazia, S. Ossetia by weekend". En.rian.ru. 28 August 2008. Archived from the original on 5 June 2011. Retrieved 22 June 2010. ^ "Diplomat: Belarus to recognise Abkhazia, South Ossetia soon". News.xinhuanet.com. 29 August 2008. Archived from the original on 11 January 2009. Retrieved 22 June 2010. ^ "U.S. SENATE UNANIMOUSLY PASSES SHAHEEN-GRAHAM RESOLUTION AFFIRMING U.S. SUPPORT FOR GEORGIAN SOVEREIGNTY". U.S. Senator for New Hempshire. Archived from the original on 6 December 2014. Retrieved 31 January 2015. ^ "Negotiations of the EU-Georgia Association Agreement". European Parliament. Archived from the original on 5 August 2015. Retrieved 31 January 2015. ^ "RESOLUTION 382 ON THE SITUATION IN GEORGIA". NATO Parliamentary Assembly. Archived from the original on 2 April 2015. Retrieved 31 January 2015. ^ Chervonnaia, Svetlana Mikhailovna. Conflict in the Caucasus: Georgia, Abkhazia, and the Russian Shadow. Gothic Image Publications, 1994. ^ "Breakaway Abkhazia seeks recognition". Al-Jazeera. 18 October 2006. Archived from the original on 5 November 2006. ^ UN Security Council Resolution 1808 Archived 26 February 2014 at the Wayback Machine. 15 April 2008. ^ Georgia-Abkhazia: Profiles Archived 30 September 2007 at the Wayback Machine. Accord: an international review of peace initiatives. Reconciliation Resources. Retrieved 2 April 2007. ^ "General Assembly adopts resolution recognising right of return by refugees, internally displaced persons to Abkhazia, Georgia". United Nations. 15 May 2008. Archived from the original on 17 September 2008. ^ Saakashvili Outlines Tbilisi’s Abkhaz Initiatives Archived 13 August 2008 at the Wayback Machine. Civil Georgia. 28 March 2008. ^ Burjanadze: Russia Behind Sokhumi’s No to New Proposals Archived 13 August 2008 at the Wayback Machine. Civil Georgia. 29 March 2008. ^ Admin. "Soares to visit the Caucasus next week". oscepa.org. Archived from the original on 14 July 2012. Retrieved 24 July 2012. ^ "Bill on Occupied Territories Signed into Law". Civil.ge. 1 July 2001. Archived from the original on 30 January 2012. Retrieved 18 February 2012. ^ "The Law of Georgia on Occupied Territories" (PDF). State Ministry for Reconciliation and Civic Equality of Georgia. 23 October 2008. Archived from the original (PDF) on 24 June 2014. ^ "CDL(2009)004: Law on occupied territories of Georgia". Venice.coe.int. 23 October 2008. Archived from the original on 13 February 2012. Retrieved 18 February 2012. ^ a b "Romania recognized neutral Georgian passports for Abkhazian and South Ossetian residents". Trend.AZ. 2 May 2013. Archived from the original on 23 February 2014. Retrieved 10 February 2014. ^ "Moscow Blasts U.S.-Georgia 'Neutral Passports'". RIA Novosti. 7 June 2012. Archived from the original on 15 February 2014. Retrieved 10 February 2014. ^ "Abkhazian leader opposed to neutral passports". DFWATCH STAFF. 19 January 2012. Archived from the original on 22 February 2014. Retrieved 10 February 2014. ^ Shamba, Sergey (6 July 2006). Стенограмма пресс-конференции в "МК": Министра иностранных дел Республики Абхазия Сергея Мироновича Шамба [Transcript of press conference at "MK": Minister for Foreign Affairs of the Republic of Abkhazia Sergey Shamba]. Moskovskij Komsomolets (Interview) (in Russian). Interviewed by Moskovskij Komsomolets Press Centre. Archived from the original on 13 October 2007. Retrieved 13 October 2007. ^ К концу 2007 года 90 процентов граждан Абхазии должны получить национальные паспорта — Президент [By the end of 2007, 90 percent of the citizens of Abkhazia should receive national passports - The President] (in Russian). Abkhaziagov.org. 29 May 2007. Archived from the original on 28 September 2007. 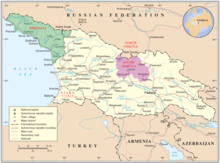 ^ "Recognition may come 'this year', South Ossetia's leaders says – Report". United Nations Observer Mission in Georgia. 21 February 2008. Archived from the original on 31 May 2008. ^ Georgia angered by Russian move Archived 20 April 2008 at the Wayback Machine. BBC News. 16 April 2008. ^ Georgia-Russia tensions ramped up. Archived 15 August 2008 at the Wayback Machine. The BBC News. 30 April 2008. ^ Halpin, Tony (20 August 2008). "Russia to recognise breakaway region's independence". The Times. London. Archived from the original on 4 September 2008. Retrieved 20 August 2008. ^ Clover, Charles; Isabel Gorst (25 August 2008). "Duma backs South Ossetia independence". Financial Times. Archived from the original on 4 June 2009. Retrieved 25 August 2008. ^ BBC News: "Russia recognises Georgian rebels" Archived 30 August 2008 at the Wayback Machine, 26 August 2008. ^ "'West Ignored Us on Kosovo', says Medvedev". Balkaninsight.com. 27 August 2008. Archived from the original on 5 June 2009. Retrieved 22 June 2010. ^ "Scheffer 'Rejects' Russia's Move, Civil.ge, 26 August 2008". Civil.ge. 1 July 2001. Archived from the original on 7 June 2011. Retrieved 22 June 2010. ^ "CoE, PACE Chairs Condemn Russia's Move, Civil Georgia, 26 August 2008". Civil.ge. 1 July 2001. Archived from the original on 7 June 2011. Retrieved 22 June 2010. ^ "OSCE Chair Condemns Russia's Recognition of Abkhazia, S. Ossetia, Civil Georgia, 26 August 2008". Civil.ge. 1 July 2001. Archived from the original on 7 June 2011. Retrieved 22 June 2010. ^ a b "West condemns Russia over Georgia, BBC, 26 August 2008". BBC News. 26 August 2008. Archived from the original on 20 April 2010. Retrieved 22 June 2010. ^ Resolving Georgian crisis may be harder after Russian recognition move Archived 15 February 2017 at the Wayback Machine, UN News Centre. ^ "Russia's build-up in the Black Sea". The Palestine Telegraph. 6 September 2009. Archived from the original on 23 July 2011. Retrieved 30 May 2011. ^ "Russia to scour Abkhazian waters for Georgian ships". Russiatoday.com. 16 September 2009. Archived from the original on 9 March 2011. Retrieved 22 June 2010. ^ Brian Whitmore (19 June 2009). "Abkhazia and the Perils of Independence". Radio Free Europe/Radio Liberty. Archived from the original on 3 September 2010. Retrieved 4 September 2010. ^ Anna Nemtsova (17 August 2010). "The Republic of Spies: How Russia's FSB Colonized Abkhazia". Newsweek. Archived from the original on 2 September 2010. Retrieved 4 September 2010. ^ Carl Schreck (25 August 2010). "Abkhazia: From Georgia's Pan into Russia's Fire". The National (UAE news organization). Archived from the original on 22 February 2014. ^ Valery Dzutsev (11 June 2010). "More Disagreements Emerge Between Abkhaz and Russian Interests". Eurasia Daily Monitor. Georgian Daily. Archived from the original on 22 July 2011. Retrieved 4 September 2010. ^ "U.S. Senator Urges Russian Peacekeepers' Withdrawal From Georgian Breakaway Republics". Mosnews.com. 22 August 2006. Archived from the original on 30 November 2006. ^ Solana fears Kosovo 'precedent' for Abkhazia, South Ossetia. (International Relations and Security Network) Archived 11 June 2008 at the Wayback Machine. ^ Russia 'not neutral' in Black Sea conflict, EU says Archived 30 September 2007 at the Wayback Machine, EUobserver, 10 October 2006. ^ Security Council extends Georgia Mission until 15 April 2007 Archived 10 March 2014 at the Wayback Machine, The UN Department of Public Information, 13 October 2006. ^ "Our work in Georgia, what we do and where - The HALO Trust". The HALO Trust. Archived from the original on 21 March 2015. Retrieved 10 March 2015. ^ "Première-Urgence NGO, France". Premiere-urgence.org. 16 December 2007. Archived from the original on 13 February 2010. Retrieved 22 June 2010. ^ Luke Coffey (1 June 2010). "Georgia and Russia: The occupation too many have forgotten". Archived from the original on 20 December 2013. Retrieved 28 January 2014. ^ "Russia welcomes Nicaragua's recognition of South Ossetia, Abkhazia". China Daily. 6 September 2008. Archived from the original on 28 May 2010. Retrieved 22 June 2010. ^ "Decreto No. 47-2008: El Presidente de la República de Nicaragua" [Decree No. 47-2008: The President of the Republic of Nicaragua] (PDF) (in Spanish). Gobierno de Reconciliación y Unidad Nacional. 3 September 2009. Archived from the original (PDF) on 10 September 2008. Retrieved 19 September 2009. ^ "Pacific island recognizes Abkhazia's independence". RIA Novosti. Archived from the original on 19 December 2009. Retrieved 15 December 2009. ^ Barry, Ellen (15 December 2009). "Abkhazia Is Recognised – by Nauru". New York Times. Archived from the original on 5 March 2013. Retrieved 29 December 2009. ^ "Georgia Severs Relations With Syria For Recognizing Abkhazia, South Ossetia". rferl.org. 29 May 2018. Archived from the original on 30 May 2018. Retrieved 29 May 2018. ^ Cтраны, признавшие независимость Республики Абхазия [Countries that have recognized the independence of the Republic of Abkhazia]. Embassy of the Republic of Abkhazia in the Bolivarian Republic of Venezuela (in Russian). Archived from the original on 18 February 2013. Retrieved 9 August 2012. ^ "Vanuatu's recognition to the Republic of Abkhazia". Government of Vanuatu. 7 October 2011. Archived from the original on 18 December 2013. Retrieved 30 October 2012. ^ "Georgia Says Vanuatu Has Withdrawn Recognition of Abkhazia". Bloomberg. 20 May 2013. Archived from the original on 6 October 2014. Retrieved 5 March 2017. ^ "Tuvalu becomes sixth state to recognize Abkhazia". RIAN. Archived from the original on 26 September 2011. Retrieved 23 September 2011. ^ "Statement of the Georgian Foreign Ministry regarding the establishment of diplomatic and consular relations". Tbilisi: Ministry of Foreign Affairs of Georgia. 31 March 2014. Archived from the original on 31 March 2014. Retrieved 31 March 2014. ^ Cutler, David (29 April 2008). "Factbox - Key facts on Georgia's breakaway Abkhazia". reliefweb.int. Reuters. Archived from the original on 29 November 2016. Retrieved 29 November 2016. ^ "Abkhazia". Encyclopædia Britannica. Archived from the original on 2 June 2010. Retrieved 7 November 2010. ^ "Travel advice by country: Georgia". United Kingdom Foreign and Commonwealth Office. Archived from the original on 28 November 2016. Retrieved 28 November 2016. "Passports & International Travel: Country Information: Georgia: Embassy Messages". U.S. Department of State. Archived from the original on 3 December 2016. Retrieved 28 November 2016. "Official advice for New Zealanders living and travelling overseas: Georgia". New Zealand Government via safetravel.govt.nz. Archived from the original on 28 November 2016. Retrieved 28 November 2016. "Travel advice: Georgia". Australian Government, Department of Foreign Affairs and Trade via smartraveller.gov.au. Archived from the original on 28 November 2016. Retrieved 28 November 2016. "Travel advice: Georgia". Irish Government, Department of Foreign Affairs and Trade. Archived from the original on 28 November 2016. Retrieved 28 November 2016. ^ Barry, Ellen (13 December 2009). "President of Abkhazia Re-elected by Wide Margin". The New York Times. Archived from the original on 8 May 2013. Retrieved 14 December 2009. ^ "Abkhazia President Sergei Bagapsh dies at 62". BBC. 29 May 2011. Archived from the original on 29 May 2011. Retrieved 29 May 2011. ^ Zarkovic Bookman, Milica (1997). The Demographic Struggle for Power: The Political Economy of Demographic Engineering in the Modern World. ISBN 978-0-7146-4732-6. ^ Halpin, Tony (30 August 2008). "Kremlin announces that South Ossetia will join "one united Russian state"". Times Online. London. Archived from the original on 3 September 2008. Retrieved 3 September 2008. ^ Gerard Toal (20 March 2014). "How people in South Ossetia, Abkhazia and Transnistria feel about annexation by Russia". Washington Post. Archived from the original on 1 July 2015. Retrieved 23 August 2017. ^ Birgitte Refslund Sørensen, Marc Vincent (2001), Caught Between Borders: Response Strategies of the Internally Displaced, pp. 234–5. Pluto Press, ISBN 978-0-7453-1818-9. ^ On Ruins of Empire: Ethnicity and Nationalism in the Former Soviet Union Georgiy I. Mirsky, p. 72. ^ White Book of Abkhazia. 1992–1993 Documents, Materials, Evidences. Moscow, 1993. ^ "Russland legitimiert Beziehungen zu Abchasien und Südossetien". De.rian.ru. Archived from the original on 16 July 2011. Retrieved 22 June 2010. ^ John Pike (13 May 2010). "Russian patrol boats arrive in Abkhazia to guard border". Globalsecurity.org. Archived from the original on 19 September 2011. Retrieved 22 June 2010. ^ Nikolaus von Twickel (26 August 2011). "No Clear Frontrunner as Abkhazia Goes to Poll". The Moscow Times. Archived from the original on 21 December 2011. Retrieved 26 August 2011. ^ Основными торговыми партнерами Абхазии продолжают оставаться Россия и Турция [Russia and Turkey continue to be Abkhazia's main trade partners]. Apsnypress.info (in Russian). 27 July 2012. Archived from the original on 2 February 2014. Retrieved 28 July 2012. ^ "Russian Federation Withdraws from Regime of Restrictions Established in 1996 for Abkhazia" (Press release). Ministry of Foreign Affairs of Russia. 6 March 2008. Archived from the original on 1 September 2008. Retrieved 6 March 2008. ^ Alexandrova, Lyudmila (9 April 2008). "Russia expands economic ties with Abkhazia, Georgia angry, CIS idle". Itar-Tass. Archived from the original on 10 May 2008. ^ "Кавказский Узел - В 2009 году туристический поток в Абхазии увеличился на 20%". Кавказский Узел. Archived from the original on 22 January 2015. Retrieved 22 January 2015. ^ "Кавказский Узел - В 2009 году Абхазию посетило около миллиона туристов". Кавказский Узел. Archived from the original on 22 January 2015. Retrieved 22 January 2015. ^ "Ростуризм увеличил туристические показатели сразу в несколько раз". tourbus.ru. Archived from the original on 22 January 2015. Retrieved 22 January 2015. ^ Численность населения Абхазии составляет 240 705 человек [The population of Abkhazia is 240,705 people]. Apsnypress.info (in Russian). 28 December 2011. Archived from the original on 9 February 2012. ^ a b c d Population censuses in Abkhazia: 1886, 1926, 1939, 1959, 1970, 1979, 1989, 2003 Archived 12 September 2008 at the Wayback Machine (in Russian) Georgian and Mingrelian figures have been conflated, as most of the "Georgians" were ethnically Mingrelian. ^ a b "Abkhazia." Encyclopædia Britannica. 2008. Encyclopædia Britannica Online Archived 10 September 2008 at the Wayback Machine 9 September 2008. ^ Gogia, Giorgi (2011). Georgia/Abkhazia: Living in Limbo - The Rights of Ethnic Georgian Returnees to the Gali District of Abkhazia (PDF). New York, NY: Human Rights Watch. p. 9. ISBN 1-56432-790-6. Archived (PDF) from the original on 17 October 2017. Retrieved 29 November 2016. ^ "ΕΕΚ". 18 December 2008. Archived from the original on 18 December 2008. Retrieved 15 April 2016. ^ a b "Abkhazia in numbers 2011". 2011. Retrieved 22 June 2016. ^ a b c Islam Tekushev (5 January 2016). "An unlikely home". openDemocracy. Archived from the original on 20 September 2016. Retrieved 22 August 2016. ^ Abkhazia's Diaspora: Dreaming of Home Archived 17 October 2017 at the Wayback Machine. Eurasianet.org (2009-03-08). Retrieved on 30 May 2011. ^ Circassians in Turkey rally for their rights Archived 14 October 2011 at the Wayback Machine. Hurriyetdailynews.com. Retrieved on 30 May 2011. ^ a b c Александр Крылов. ЕДИНАЯ ВЕРА АБХАЗСКИХ "ХРИСТИАН" И "МУСУЛЬМАН". Особенности религиозного сознания в современной Абхазии Archived 27 September 2007 at the Wayback Machine. Portal-credo.ru (2004-03-17). Retrieved on 30 May 2011. ^ Hewitt, George (1998). The Abkhazians: a handbook. Palgrave Macmillan. p. 205. ISBN 978-0-312-21975-8. ^ "Russia: Other Points of View: ABKHAZIA versus GEORGIA: Implications for U.S. Policy toward Russia". Russiaotherpointsofview.com. 30 March 2010. Archived from the original on 23 February 2014. Retrieved 25 March 2013. ^ Georgia: International Religious Freedom Report 2005. Archived 20 January 2012 at the Wayback Machine The United States Department of State. Retrieved 24 May 2007. ^ Конституция Республики Абхазия: Глава 2 Права и свободы человека и Гражданина: Статья 12 [Constitution of the Republic of Abkhazia: Chapter 2 Rights and freedoms of the person and citizen: Article 12] (in Russian). dp.abhazia.com. 26 November 1994. Archived from the original on 28 September 2007. ^ "Constitution of Abkhazia". Wikisource. Archived from the original on 17 October 2017. Retrieved 25 July 2017. ^ "Nation Profile; Abkhazia". Nationalia. Ceimen: Centre Internationale Escarré per a les Minories Étniques i les Nacions. Archived from the original on 16 October 2017. Retrieved 25 July 2017. ^ a b c Comai, Giorgio (11 June 2012). "In Abkhazia, worried about the language law". Osservatorio Balcani e Caucaso Transeuropa. Archived from the original on 16 October 2017. Retrieved 25 July 2017. ^ Mateu, Sandra Veloy (16 September 2016). "Language policy in Abkhazia: promoting Abkhazian or forgetting Georgian?". Nationalia. Archived from the original on 25 September 2017. Retrieved 25 July 2017. ^ a b c Inal Khashig (27 June 2002). "Abkhaz Rush For Russian Passports". Institute for War & Peace Reporting. Archived from the original on 22 February 2014. Retrieved 10 February 2014. ^ "Russian Federation: Legal Aspects of War in Georgia". Library of Congress. September 2008. Archived from the original on 16 July 2014. ^ Anton Krivenuk (1 February 2011). "Abkhaz Rush For Russian Passports". GeorgiaTimes. Archived from the original on 22 February 2014. Retrieved 10 February 2014. ^ a b Olesya Vartanyan (24 September 2013). "Abkhaz Decision on Passports Leaves Many Georgians in Gali Worried". Civil.ge. Archived from the original on 22 February 2014. Retrieved 10 February 2014. ^ a b c "Sokhumi Suspends Issuing Abkhaz Passports to Ethnic Georgians". Civil.ge. 14 May 2013. Archived from the original on 22 February 2014. Retrieved 10 February 2014. ^ Giorgi Menabde (3 October 2013). "Authorities in Abkhazia Plan to Strip Georgians of Citizenship". Jamestown Foundation. Archived from the original on 22 February 2014. Retrieved 10 February 2014. ^ Eka Kevanishvili (22 March 2009). "Teachers In Abkhazia's Gali District Under Pressure To Give Up Georgian Language". Radio Free Europe. Archived from the original on 15 September 2016. Retrieved 11 June 2016. ^ "Сухуми требует от директоров грузинских школ перехода на русскоязычное обучение". Сухуми требует от директоров грузинских школ перехода на русскоязычное обучение. Archived from the original on 21 February 2014. Retrieved 10 February 2014. ^ Giorgio Comai (6 November 2012). "In Abkhazia, worried about the language law". Osservatorio balconie caucaso. Archived from the original on 10 August 2016. Retrieved 11 June 2016. ^ "Top Abkhazian security official dismissed". DFWATCH STAFF. 30 October 2013. Archived from the original on 22 February 2014. Retrieved 14 February 2014. ^ "Altınpost - Abhazya Haberleri - Abhazya Basketbol Milli Takımı KKTC Milli Takımını 76-59 Yendi". altinpost.org. Archived from the original on 5 December 2017. Retrieved 4 December 2017. ^ Rayhan Demytrie (2 June 2016). "A World Cup for unrecognised states". BBC News. Archived from the original on 5 June 2016. Retrieved 16 July 2016. ^ "A World Cup for countries that are not actually countries". The Economist. 6 June 2016. Archived from the original on 13 July 2016. Retrieved 16 July 2016. Odisheli, Manana (2018). "Abasgia". In Nicholson, Oliver (ed.). The Oxford Dictionary of Late Antiquity. Oxford: Oxford University Press. ISBN 978-0-19-866277-8. Crisis profile, Georgia, Abkhazia, S. Ossetia, from Reuters Alertnet. (in English) (in Russian) (in Georgian) Government of the Autonomous Republic of Abkhazia (official webpage). (in English) (in Russian) (in Turkish) (in Abkhazian) President of the Republic of Abkhazia (official site). (in English) (in Russian) (in Abkhazian) Ministry of Foreign Affairs of the Republic of Abkhazia (official site). (in Russian) Archaeology and ethnography of Abkhazia, Abkhaz Institute of Social Studies, Abkhaz State Museum. 1 Disputed statehood — partial international recognition, but considered by most countries to be Georgian territory.